Is This The Summer of 2007? The summer of 2007 was a great moment. We were enjoying one of the strongest booms in both the debt and equity markets that any of us had experienced in our lifetimes. Just the sort of markets we’ve been enjoying for the past year or so. 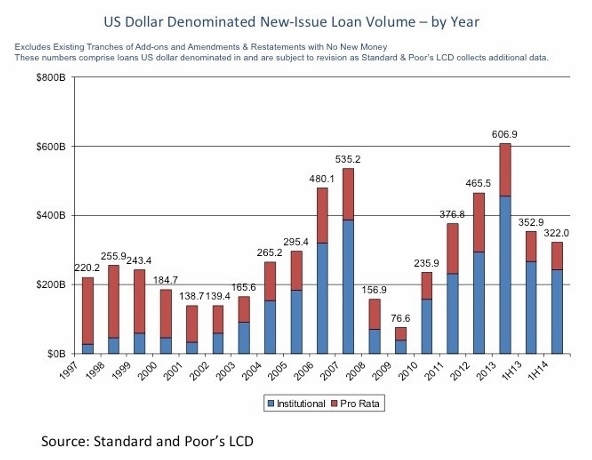 The leveraged lending markets have fully recovered from their low point following the market crash of 2008 and 2009 and volume reached a new high in 2013. While market activity declined slightly in the first half of 2014 from the prior year, current activity levels remain very high. The question of the day: Are we, like Bill Murray in Groundhog Day, destined to endlessly repeat this cycle with limited ability to prevent a repeat of the disaster that befell us in 2008-2009. We’ve just interviewed one of the world’s leading authorities on the private debt markets to help us better understand the current state of the debt markets and what this portends for the level of deal activity going forward. Randy Schwimmer was a pioneer in developing middle market loan syndication markets in the 1980s, leading the effort for what is now J.P. Morgan and later BNP Paribas. With a small group of partners he formed Churchill Financial in 2007. They were successful in raising a $1.2 billion loan fund before the financial crash closed the markets and were left with more than $500 million of dry powder after the crash. Leveraging this success, they were acquired by Carlyle in 2011 where they began building that firm’s private debt business. Permalink | | Comments Off on Is This The Summer of 2007?